Ridgeway Radio's President, Dorchester's Town Crier Alistair Chisholm recently marked the 250th Anniversary of Lloyds with a special Cry. Pictured with Alistair on Thursday 9th July 2015, Fiona Neale and Colin Cracknell from Dorchester Lloyds' management presented a cheque to Ridgeway Radio's Vice-Chairman Peter Foster and Secretary Heather Foster as a donation to Alistair's nominated good cause. 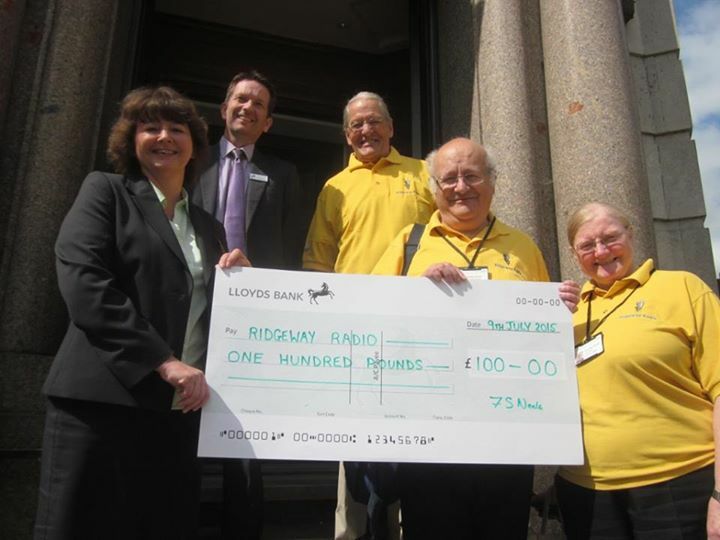 Congratulations to Lloyds on this historic milestone - Ridgeway Radio has 200 years to catch up ! !